The R-PLEX Human Uromodulin Antibody Set includes a matched capture and detection antibody pair and calibrator for the quick and easy measurement of Uromodulin in biological samples. R-PLEX products leverage MSD’s electrochemiluminescence technology for better sensitivity and a larger dynamic range than traditional ELISAs. R-PLEX matched antibody sets enable the development of singleplex and multiplex immunoassays. Individual assays may be developed using MSD avidin- or streptavidin-coated plates. Custom multiplex assays with any combination of R-PLEX analytes, as well as R-PLEX plus U-PLEX analytes can be developed on U-PLEX MULTI-SPOT plates. To learn more about the advantages of R-PLEX products click here. 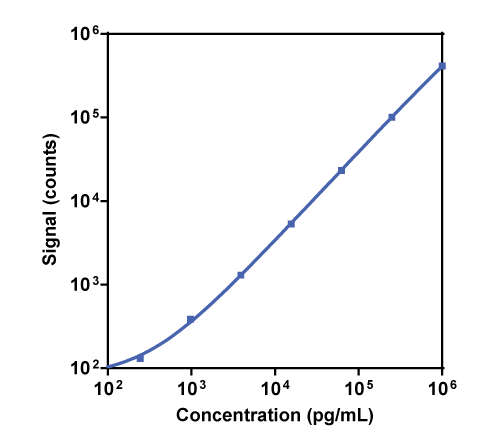 Calibration curve for the R-PLEX Human Uromodulin Antibody Set was assessed and representative data are presented below. Description - Uromodulin (UMOD, Tamm-Horsfall glycoprotein, THP, HNFJ, THGP) is a glycoprotein produced in the thick ascending limb of the loop of Henle. It is the most abundant protein in normal, healthy urine. Increased expression of UMOD can cause it to leak into the renal interstitium resulting in the recruitment and stimulation of an immune response, causing inflammation and kidney damage. UMOD deposits have been observed in renal biopsies of tubulointerstitial disease. Uromodulin along with uropontin and nephrocalcin are the primary components of kidney stones.